With over 10 years of experience, Modernize is here for you when you are actively looking for replacement windows in El Paso, TX. Comparing quotes from local window installers will help you find the best contractors for your window upgrade projects. Get free quotes from the best window replacement contractors in El Paso, TX, ready to complete your project. If the windows in your El Paso home are over 15 years old, or if they have begun to show signs of wear such as trapping moisture between the panes or becoming difficult to open and close, it is probably time to consider replacement windows. New windows are a significant financial investment, and it is important that you research the available options before making a purchase. There are many factors to consider, including the operational style, design customizations, and material choices. In addition to the basic choices every homeowner has to make, as a homeowner living in El Paso, there are location specific factors that should influence your purchase.The climate in El Paso is unique, and a window designed specifically for the climate will perform best in your home. There are also permit and licensing regulations specific to your city that should influence the window choice you make. In this El Paso window buying guide, you will find the information you need to find the most functional and energy efficient windows for your home. A basic understanding of the difference between replacement and new construction windows as well as the operational and design options available, are the first things to consider before making a purchase. If you are replacing windows in a pre existing home, replacement windows are typically the appropriate choice. These windows are custom designed for a precise fit in the space left behind by the old windows. In comparison, new construction windows are most appropriate for new building or major remodels because they are designed to be secured directly to the exposed studs and frames of the home. In addition to the choice of new construction or replacement windows, there are also numerous operational designs to choose from. Durable and low maintenance options include double hung windows, sliding windows, and casement windows, all opening to to allow ventilation of the room where they are installed. Stationary options include custom shaped and sized picture and arched windows, designed specifically for bringing additional natural light into the home. Most window styles are available with window frames made from vinyl, wood, aluminum, or fiberglass and can be customized with various colors and finishes. Multiple hardware finish options and glass grid designs are also available, making it is possible to find a window that fits perfectly with the decor of any home. If your home is located in El Paso, there are regulations put in place by the city that will influence the windows you choose to install in your home. Whether you plan to install your windows yourself, or hire a contractor to install your windows, there must be a permit in place for the work before the new windows are installed. The Department of Planning & Building provides the appropriate applications online in their document database. If you are planning on hiring a contractor to install new windows in your home, you will want to be sure they have a general builder’s license and workers’ compensation insurance. All contractors working in Texas can apply for their license through the State of Texas at the Department of Housing & Community Affairs. Workers’ compensation insurance protects you from liability, including the costs of medical bills or missed work time, if one of your contractor’s employees is hurt while working on your home. The cost of new windows varies greatly depending on the brand chosen, materials used, and the shape and size of the windows purchased. This can make it difficult to draft a budget before beginning your shopping. In general, vinyl replacement windows cost between $450 and $600 and wood replacement windows cost between $800 and $1000. When budgeting for new windows, you will want to include an additional $50 to $100 for each window to cover the cost of installation. Since all available energy efficiency federal tax credits expired in 2014, it can be difficult to find assistance paying for replacement windows in El Paso. One program, Project Bravo, provides weatherization of homes including window replacements to qualifying households. This program is specifically targeted towards low income families. Homeowners who do not meet the income requirements will typically have to fund their window replacements themselves by saving cash or applying for a zero interest credit card or home equity line of credit. 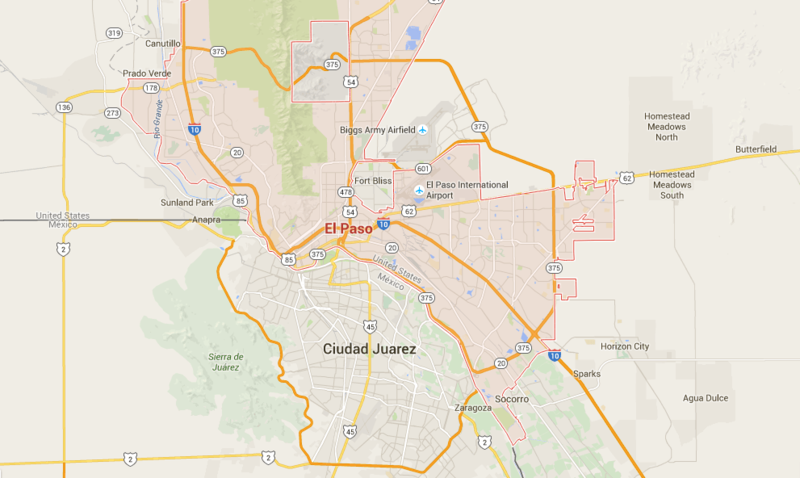 According to ENERGY STAR® guidelines, El Paso is located in the South-Central Climate Zone. This zone is characterized by hot and humid summers and cold, but mild winters. In order to keep their homes comfortable year round, homeowners will find they rely heavily on both their heating and cooling systems. Regular use of heating and cooling systems can be a significant expense, and installing energy efficient windows is one way to offset utility costs. Windows that perform well in hot summers and cold winters are the best choice for El Paso homes. The simplest way to find the right window for the climate is understanding the National Fenestration Ratings Council label that can be found on all new windows. There are primarily two numbers on the NFRC label you should be concerned with if you are installing windows in homes located in El Paso. The U-Factor rating is provided to disclose how much heat is able to enter or leave the home through the window. In El Paso, ENERGY STAR® requires all new replacement windows to have a U-Factor rating of 0.30 or less. The Solar Heat Gain Coefficient is the second important number that should influence your window purchase. This number demonstrates how much solar radiation passes through the window, providing natural heat to the home. Since El Paso is typically very warm during the summer months, a low Solar Heat Gain Coefficient is best and ENERGY STAR® requires a rating of 0.25 or less. Since summers are normally humid in El Paso, the last thing to consider is how well the windows you purchase will protect your home from excess moisture in the air. A condensation resistance rating is not always present on new windows, so inquire about each window rating before making a purchase. This number, rated from 0 to 100, represents how well a replacement window resists the humidity in the air. When you find energy efficient windows designed specifically for the climate where you live, you can reduce your household expenses by lowering the cost of heating and cooling your home. In El Paso, homeowners who purchase ENERGY STAR® compliant windows can expect a yearly utility savings of as much as $266. If you decide to sell your home, you can also expect a 70% return-on-investment. Making the switch to more efficient and weather resistant windows not only saves you money, it allows you to live a more sustainable lifestyle by reducing your consumption of nonrenewable energy sources for heating and cooling your home.